Hiking the Torres del Paine Avid Circuit takes you around the Paine Massif and lets you explore portions of each unique environment. 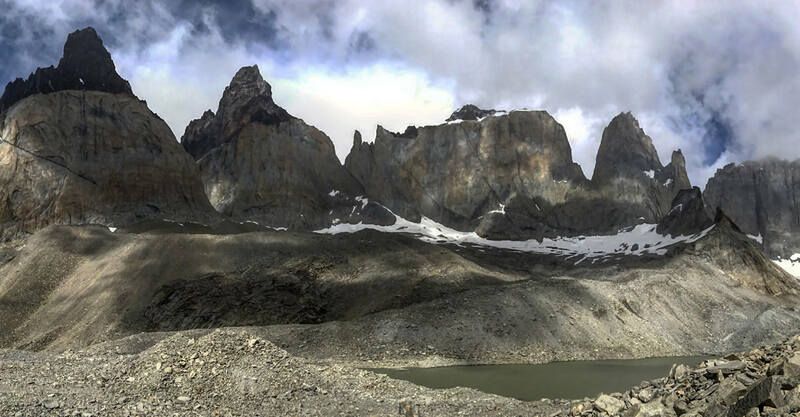 This multiple-day expedition is designed for serious trekkers and is the most difficult trek in Torres del Paine. 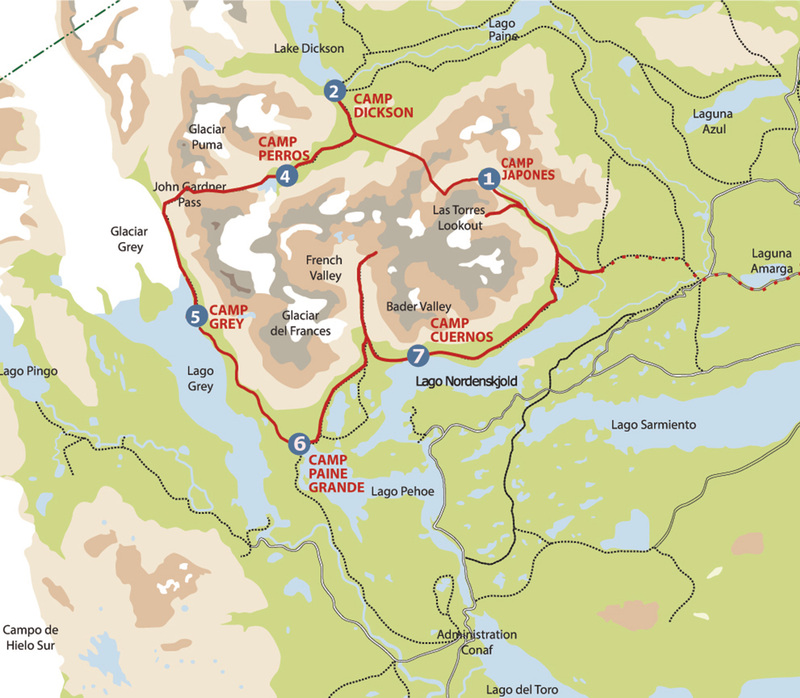 You will see the Torres Lookout, Oggioni Pass, the French Valley, the Cuernos, Glacier Grey, Glacier Dickson, Lake Paine, the John Gardner Pass, the Southern Ice Field and many other amazing sites. The Oggioni Pass is rarely crossed by visitors to Torres del Paine. 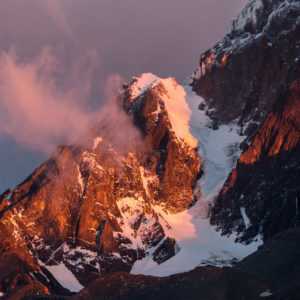 The second day of this adventure takes you along an unmarked trail and over the Oggioni Pass, where you will be able to look down on the John Gardner Pass, Glaciers Grey and Dickson, and the Southern Ice Field. 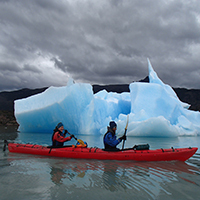 Highlights: Views of Glacier Grey and the Southern Ice Field, the many lakes of Torres del Paine, the hanging glaciers of the French Valley, the granite towers which are the namesake of Torres del Paine, the rarely seen Oggioni Pass, the John Gardner Pass. After an early breakfast you will depart from Puerto Natales towards Torres del Paine National Park with your guide. You will hop on a bus and be taken to the park entrance at Laguna Amarga, which is about 2 hours away. You will begin your trek by hiking up Almirante Nieto – a mountain taking you to an incredible view of Lake Nordenskjold and Silence Valley. 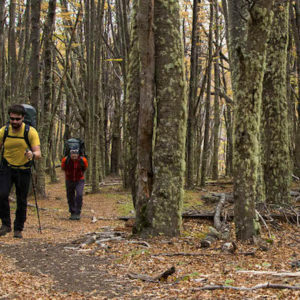 After passing by Refugio & Camping Chileno, you will hike for one hour through a dense Lenga forest. After leaving the forest, you will approach Campamento Las Torres. You will leave your things at Campamento Las Torres before continuing up a steep moraine. Finally, you will see the icon of Torres del Paine National Park – Las Torres! After returning to Campamento Las Torres, you will hike to a climber’s camp called Campamento Japones. Campamento Japones is the original camping space where the climbing pioneers stopped to get away from the weather and to prepare their climb to the top of Las Torres. You will have dinner and begin to prepare for tomorrow’s big day! Following an early breakfast, you will pack up and begin today’s hike. The Oggioni Pass is very unique and off the beaten track – very few visitors to the park take this hike! The trail is only marked by small stone towers left behind by previous hikers. You will begin by following the trail to the back side of Las Torres, but then – as the trail continues straight – you will detour and hike towards a waterfall. You will pass over the waterfall (on a natural stone bridge) and then hike over two glacier moraines. Finally, you will start climbing uphill. If you have a good map, you will be able to see Oggioni Mountain on the backside of Silence Valley. After making it over the pass, you will walk through a thick forest and from a distance you will be able to see Refugio & Camping Dickson. You will continue walking until you finally reach the camp. Today is a long day and you will be happy to arrive after such an exciting, as well as challenging, day! Today can be used as a rest day. It can also be used as a day to explore the surrounding (and very scenic) area of Refugio Dickson. In the chance that the pass is not made on day 2 then today will be reserved for a second attempt. This spectacular day will begin with a leisurely hike in the energizing mountain air to the entrance of the French Valley. As you walk along the border of Lake Skottsberg, you will admire the tremendous peaks towering in front of you – Los Cuernos! After about 2.5 hours, you will arrive to Campamento Italiano where you can rest for a bit before continuing your journey. As you ascend into the valley, the views in every direction — of Lake Nordenskjold, Los Cuernos, and the French Glacier — are absolutely stunning. In the back of the valley you can see various peaks. After soaking up the view, you will hike back down to Campamento Italiano to continue alongside rolling hills as you follow the coastline of Lake Nordenskjold. You will continue on for another two hours until you reach your camp, located on the lake. After a relaxing afternoon and a filling dinner, you will go to sleep for a deserving night’s rest.